Offers worldwide issues with an emphasis on those of South Africa. Auctions of refurbished, discontinued, and returned items, organized by category. Worldwide auctions of Ty and similar toys for the collector and enthusiast. Auctions, appraisals, estates auctions, fine art and collectibles, plus an online gallery and events calendar. Interactive, no minimum bid sports cards auctions. Conducts postal auctions for stamps, covers, postmarks, history, and philatelic stationery. A leading auction company for antique toy tractors. Live on-line auctions and Internet bidding available. 9 Smith Auction Company Estate auctions. Estate auctions. Speciality auctions of antiques, toys, trains, vintage radios, and pottery. Home page for book auctions, including antiquarian, childrens, fiction and bulk auctions. Full service auctioneer for estates, antiques and collectibles, real estate and charity auctions. Specializes in auctions of swords, sabers, and edged weapons as well as flintlock and percussion muskets and antique pistols. Art auctions held twice a year specializing in Canadian and International art from estates, corporate and institutional collections. 16 Rauch Auctions H. D.
H. D. Rauch GmbH, Vienna, Austria. Auctions and online shop. Coins, stamps, decorations, and medals. Specializing in estate and real estate auctions. Contains upcoming events. Located in Prosperity, Pennsylvania. Sports collectible auctions featuring football, baseball, basketball, and hockey trading cards. Holds regular postal auctions of Australasian and European philatelic material including stamps and history items. Quarterly auctions featuring over 400 original antique maps, atlases, globes, decorative graphics and related material. 16th-19th Centuries. On-line bidding & printed catalogs. Etude Tajan : Frances Leading Auction House in Fine Art Auctions. Auctions in locations in Maryland, Florida, and Louisiana. Includes links and specifics to each auction and general information about the auction group and services. Central US live coin auctions. Includes complete listing with images. Auctions scheduled every three weeks. Phone and email bids accepted. Free computer and software auctions. Also has options for other categories. Specializes in antique, real estate, farm equipment, estate, and personal property auctions, and offers appraisals. Includes owner profile, a schedule and photographs. Located in Cullen, Virginia. Online auctions, gallery auctions, and a charter member of Ebays 'Great Collections'. Bid online everyday. Specializing in fine estate property: art, antiques, collectibles, jewelry, silver, porcelain, books. Manions auctions antique and collectible firarms and militaria by both catalog and internet. Nine auctions a year, a new auction every six weeks. Providing a search of auctioneer held auctions. Search by item, zip code, auctioneer, and/or calendar date. Listing of upcoming auctions and foreclosures in the state of Maryland updated daily. If the business hours of Cape Stamps in may vary on holidays like Valentine’s Day, Washington’s Birthday, St. Patrick’s Day, Easter, Easter eve and Mother’s day. We display standard opening hours and price ranges in our profile site. We recommend to check out capestamps.com/ for further information. 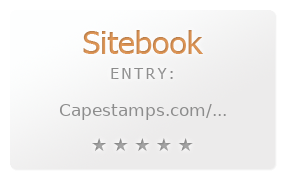 You can also search for Alternatives for capestamps.com/ on our Review Site Sitebook.org All trademarks are the property of their respective owners. If we should delete this entry, please send us a short E-Mail.